across all devices. 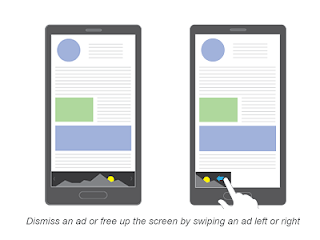 In this same spirit, we’re happy to let you know about mobile anchor ads for smartphones, a new feature we’re starting to make available that’s focused on giving users a better experience with ads on mobile devices. Mobile anchor ads work by allowing a 320x50 banner ad unit to be anchored to the bottom of the smartphone screen, staying there when your users scroll up or down the page. At the same time, users remain in control -- they can dismiss an ad when they find it’s not relevant or want to free up the screen space, simply by swiping the ad left or right. When this happens, the anchor ad will fade and be dismissed and no other anchor ad will display unless the user reloads or visits another page. The mobile anchor ads experience reflects our continued focus on providing users with control. As we’ve seen from our TrueView video ads and Mute this ad feature, users prefer having choice and control when it comes to viewing ads. In addition, the prominence of mobile anchor ads will give advertisers enhanced visibility while helping improve performance for you, and also remove the need to overload your mobile pages with ads. We’ve started enabling this feature for a select group of publishers today, and will gradually roll it out to everyone over the coming months. Thanks for all of the feedback you’ve provided to date on adapting to the multi-screen environment. Please do continue to share your suggestions so we can keep improving AdSense for you. Watch this space for more news and updates in the near future! Over the past few months, we’ve regularly talked about the growing number of users accessing publisher content via mobile devices, and the importance of creating a positive user experience across all devices. In this same spirit, we’re happy to let you know about mobile anchor ads for smartphones, a new feature we’re starting to make available that’s focused on giving users a better experience with ads on mobile devices.